In October 2016, Al Jazeera did a stunning piece on the hottest new scene in Mumbai town: underground rap. It looked very closely at “Indianizing Hip-hop” specifically through the eyes of one rapper Navid Shaikh or Naezy. 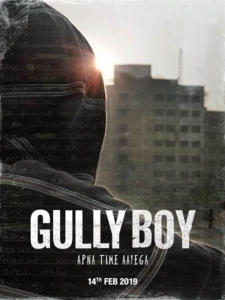 Only 2 years on and this same theme is now a major Bollywood film Gully Boy. 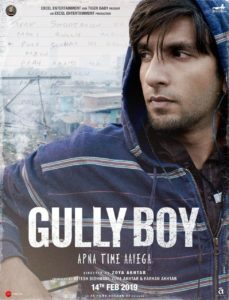 Directed by Zoya Akhtar and led by Ranveer Singh, this story tells not only of Naezy’s rise to the heights of this young movement but also compatriot Divine in a musical album subtitled “Apna Time Aayega”. Its music would not be complete or correct without inputs from Divine and Naezy themselves but also from a multitude of the stars of this form with Spitfire, Rishi Rich and Dub Sharma just to name a few also getting in on the act. To round the album with the necessary non-rap songs Karsh Kale, Ankur Tewari and Jasleen Royal also make major contributions. There are 18 songs on this album but its still only a little longer then a standard 6-song feature, so strap in for some hard beats and fast lyrics which won’t stop till the end. Spitfire writes the words and music for the first song Asli Hip Hop. At only 100 seconds, its over before its begun but is a short and sharp hard intro into what is to come. Beat boxing and Ranveer Singh on the mic, telling it how it is. The words are more predominantly Urdu, and this isn’t as fast as some of the ones below, so it makes for an easy entrance for those new to this world. Meri Gully Mein brings together all the stars and is certainly one of the showcase pieces of this album. Lyrics and music by Divine and Neazy, Ranveer joins them on the mic for a 3-minute blast of drums, synth and some fast rap. The preview visuals available for this song are quite simply electric with all the stops pulled out on the moves. However, there is a heavy sense of auto-tune as if a listener gets lost in the lyrics, the music is no help in bringing them back out. The next 2 songs are called Doori and Doori Poem. These are both simply an ode to mother. Javed Akhtar writes the lyrics, Rishi Rich on the music and Ranveer on the mic makes for a powerful combination of words and gansta stylings. Violins and piano are added to give them the touch that is needed to soften their hard edge, but its strongest moment is in stopping all the music long enough to give the lyrics full control with Ranveer to deliver them. Train Song is what it says it is. Raghu Dixit and Karsh Kale work with lyrics predominantly given by Javed Akhtar with Midival Punditz using clapping to give the rhythm of a train. An acoustic drum and guitar give the necessary backing to both singers creating a nearly African sound. Karsh singing in English reminds listeners of Paul Simon and even the combination with Raghu Dixit will alight memories of Colonial Cousins. It’s a great change up from all the hip-hop/rap so far on this album but is very disappointing. Dub Sharma gets into the act in a 2-parter song of his own, Jingostan Beatbox and Jingostan. In this album ‘Jingostan Beatbox’ is listed earlier than ‘Jingostan’ itself which is different from normal arrangements but in this case makes a lot of sense. There is a spooky and mysterious sense in the lack of any seeming orchestration, the only backing being the beat boxer. Even then the beat is quite loud and angry throughout, with Dub’s lyrics telling of how even in 2018 there is much to fear. Between his accent and some effects there is enough of a blurring that he could be saying Hindustan which is less obvious in ‘Jingostan’ without the beat boxer. As these are both the same song just with different beat structures and instrumentations, it has a “heard it” quality about it. Sher Aaya Sher is a fan service song with Divine on the mic with the words and Chandrashekhar Kunder on the music. This is some old school 90s rap, like those put out in the works of Snoop Dogg and Dr Dre. There is a strong sense of auto-tune which means unless the audience is going to be hooked on Divine’s spitting, this is not going to be a strong seller. There is a female voice that permeates throughout but really has absolutely no point. This song is either Divine or nothing. Change up time again with Jahaan Tu Chala. Jasleen Royal sings and works with Arjun Chandy on the music for this song written by Aditya Sharma. This is the first song on the album where the listener is introduced to the female lead in Alia Bhatt. This is the typical female-side love song, with all the longing and patience that the stereotype seems to encompass. Certainly nothing new here but the end of 2018 brought love songs to the hilt in all the charts so being one of the few purely female-side songs, this too has a chance. How better to get a song high in the charts then to make it a song for the people. Divine and Dub Sharma combine here for the next song Azadi. Very loud to the point that the instruments often overrun the lyrics, this is synth and drums used in a classic call-and-response style piece. Freedom from oppression, freedom from depression, freedom for repression is the theme of the lyrics and while this is not typical for Bollywood cinema songs, this is run-of-the-mill stuff for rappers around the world. It is this sort of song that some claim brought about the Arab spring of 2012, the effects of which still reverberate around that region now. Where there is love, there is also break-up. This is a lesson Bollywood has taught for its entire history. So, the next song is Kab Se Kab Tak. Ranveer on the mic with lines like “Mujhko chahiye tere ishq ka nasha, tujko chahiye mere dil ke tukdo ka maza”. A light and easy beat I generated by Ankur Tewari and Karsh Kale over which Ranveer delivers in hip-hop exactly why his girlfriend no longer wants him. Not that he’s taking any responsibility for anything! Vibha Saraf gives a Bond girl performance for the choruses to ‘hide the hurt’ but this one is slowed down specifically so no one misses out on the words that strike at the heart. In a Bollywood film, even the villain gets a decent song… thus, the next song is Kaam Bhaari. Sung and written by Kaam Bhaari, with Ankur Tewari lending a hand with the music direction, this is no holes barred fast rap. Beat boxing, shennai, tabla and a bass guitar all do their best to drown out the words and the listener will struggle and need to really concentrate on this one. At the end of the song, it’s really a rap about taking responsibility for yourself to become the best of what you are. Ek Hee Raasta is again self-explanatory from the title itself. Ranveer on the mic, with Rishi Rich providing soft synth sounds to highlight softly spoken lyrics by Javed Akhtar. This song has no time for mess and fuss being a total of 70 seconds long. Ankur Tewari takes full responsibility for song 14 Jeene Mein Aaye Maza. This is all softly, softly with banjo and tambourine behind Ankur’s soft vocals. Have your internet handy to look up the lyrics as they are so softly sung that they disappear beneath the instruments, only the chorus line being clearly audible and understandable. Ace joins in with Har Gham Mein Khushi Hai. He takes care of vocals and lyrics with IshQ Bector dealing with the music. Following Ankur’s lead from the previous song, this is also impossible to understand the lyrics of but no real excuses here as the backing is mostly auto-tune with a twist thrown in of a church organ used for bridges. As per previous, keep your internet handy. Modern Bollywood music can’t do without a classic club song, so we have Goriye. There’re all the standards to be had with a mixture of classic Punjabi lyrics and singers, a known hip-hop artist to give a gentle rap break and some supremely repetitive backing sounds. This is very close to being the longest song on this album and goes nowhere at all. Last song is India 91. An interesting mix of classical sounds with a mrydangam giving the beat but MC Altaf and Mc TodFod are not about to depart from the hip-hop vibe of the rest of the album bringing in synth sounds and street lyrics which they have written themselves. This is likely to be the ending song as it has no specific message, but it does a job. It is often said too many cooks spoil the broth. This is not an unjustified statement within this album. While each song serves a purpose and/or delivers an important message on behalf of the story, which is necessary in a film about music of any genre, some of them require listeners to look up the lyrics, some are unnecessary in this quite long album (again not for length of the whole album, just the sheer weight of the number of songs) and some hit so hard it could be the audience’s ears that are being beat boxed. As an overall flow, with a lot of albums its easy to see where the story is leading: intro, love story, breakup, action and togetherness is a fairly typical 6-song album approach. 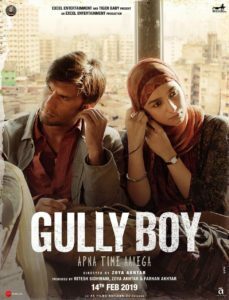 However, with Gully Boy the listener gets battered by a lot of lyrics, some fast, some slow with music all over the place and trying to do everything at once for everyone. Some standouts like the feature songs and Jingostan (the listener to choose the version that suits best) really elevate both the album and the underground hip-hop scene, but the rest leave audiences scratching their heads about what they just heard. 15 queries in 0.405 seconds.